Making bread has always seemed a little bit intimidating. People talk about how simple it is, and then write recipes with terms like "autolyse" and "preferment." But several years after the rest of the U.S. caught on to the wonders of no-knead bread, I finally tried it and discovered, like the thousands who'd tried it before me, that it really is simple and delicious. I've been making it regularly for a year or so, but hadn't branched out much beyond that. 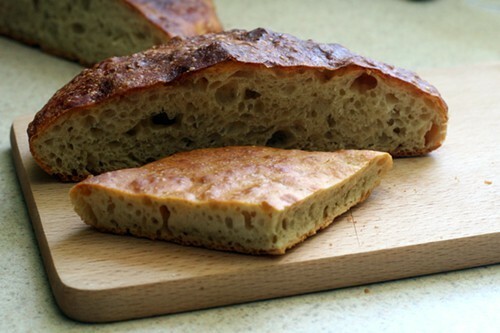 A few months ago, though, I came across a Lucky Peach recipe by Ben Wolfe advertised as "miso sourdough bread," a variation on the no-knead recipe in which miso is used to introduce bacteria and yeast (which would traditionally be added by a sourdough starter). I love sourdough, but making a sourdough starter and keeping it fed has always seemed like a lot of commitment. I had shiro (white) miso in the fridge already, so I started a batch immediately. I noticed a couple of odd things in the recipe, however. While it uses the usual three cups of flour and a quarter teaspoon of yeast, it calls for one and a quarter cups of water instead of one and five-eighths—though it did specify that the dough should be wet and sticky. With the smaller amount of water it was neither, so I added more until it looked right. 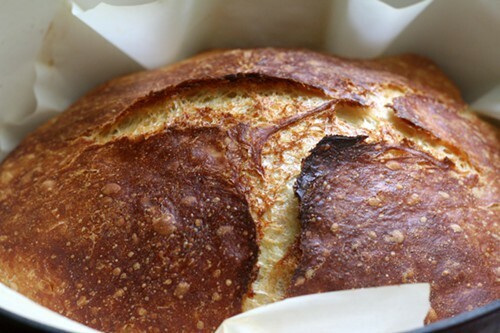 The recipe also used a tablespoon of salt—in addition to two tablespoons of miso, which is very salty—instead of the 1.25 teaspoons of salt in Jim Lahey's no-knead bread recipe. (The amount of salt listed on the website is now a teaspoon, so I think the original amount was a typo that's been corrected. At first I assumed it was user error, but the version I downloaded to my Paprika recipe app says a tablespoon.) I tried to be conservative, using a scant two teaspoons of salt and two tablespoons of miso, and still ended up with dough that was way too salty. So I added another cup and a half of flour with proportional amounts of water and yeast until the dough was edible (though still pretty salty). After 24 hours the dough is supposed to smell like "microbe heaven." I'm not sure I could identify that scent offhand, but the dough smelled pretty much like it normally does. There certainly didn't seem to be any crazy fermentation going on. I did the second rise and baking the same way I usually do, which is a little different than the method Lahey recommends. It's a combination of techniques from blogs I read (at this point I can't remember which ones), and possibly a little of my own invention. 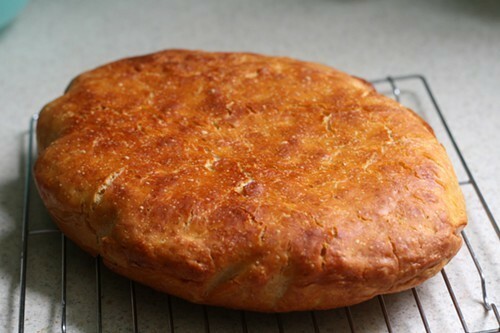 I've described it in the recipe at the bottom of the post, but the short version is that I put the bread on parchment paper instead of a dish towel for the second rise, and then bake the bread on that parchment paper, inside the covered pot. The finished miso bread didn't taste sour at all, but it did have a distinct umami quality to it that gave it an almost cheesy flavor, like Parmesan or another aged cheese had been baked into the dough. It was actually pretty delicious. I suspected that the reason I hadn't gotten the fermentation I needed was that when it's cool out, my kitchen is much closer to 65 degrees than the recommended 75 degrees. Wolfe uses a seedling heat mat to achieve higher temperatures, but I figured if I added more miso and let it ferment longer I could accomplish the same thing. For my second attempt, I used three tablespoons of miso and about a half teaspoon of salt. That turned out to be a disaster. Or, depending on your definition of success, it worked perfectly. 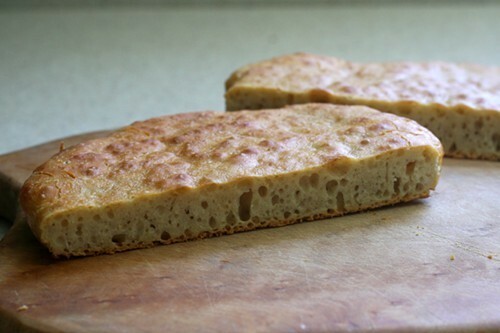 I produced bread with a great flavor—it just happened to be completely flat. 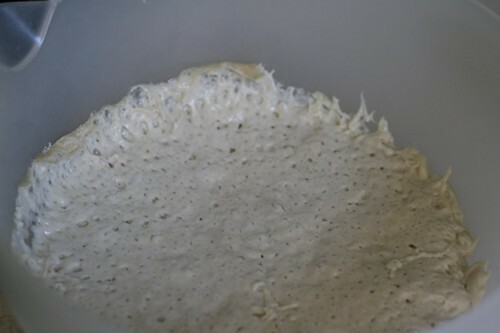 The dough rose normally at first, but after about 24 hours it lost its oomph and started slowly sinking in the bowl. When I turned it out onto the parchment paper before the second rise, it oozed like a thick batter, without any of the soft springiness that the dough normally has. When I transferred it to the pot it spread to the edges of the dish. When I tasted it, though, I finally detected the elusive sourdough flavor. 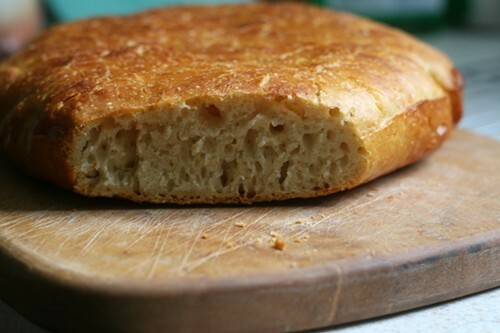 Aside from the bread's flatness, it was perfect: crispy crust, moist interior. It had the same umami qualities I'd noticed in the first one, with even more depth of flavor and an intriguing sourness that came through at the end. My first theory was that the yeast had used up their food and started to die off before I baked the bread, causing it to rise poorly. When I started reading about long fermentation times, though, I learned that as dough ferments, it becomes more acidic and produces alcohol, which inhibits the yeast's activity and breaks down the gluten. 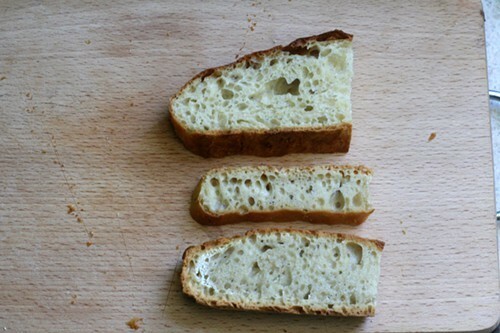 That acidity gave me the sourness I was looking for, but also stopped the bread from rising as well as I wanted it to. On one forum discussing long fermentation times a commenter said that eventually you'll end up with dough soup, which is as apt a description as I've found. My dough hadn't turned into soup yet, but it was well on its way. There were two things I could try: putting the dough into the refrigerator to proof, which would slow down the action of the yeast (many recipes I've read recommend this anyway for producing very flavorful loaves), or letting it rise for 24 hours at the recommended 75 degrees. I discovered that leaving my oven light on (but not turning on the gas) brought the temperature to 75 degrees. I made another batch, this time with four tablespoons of miso and no salt, and divided it in half. Part of it would go into the oven with the light on for 24 hours, the other part into the refrigerator for three days (after the initial rise). After 24 hours, the dough that had been left at 75 degrees looked very sad. I started the dough in the morning, and after about eight hours the part that had been in the oven was softer, more bubbly, and more fermenty/yeasty smelling than the half I'd left on the counter for the first rise. 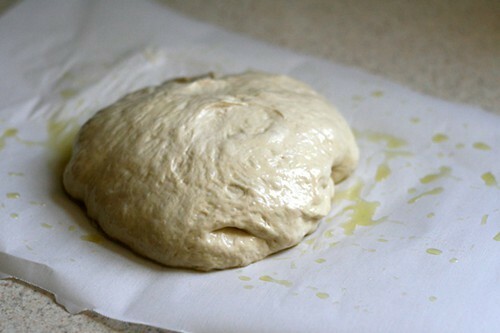 A few hours later the oven dough was looking suspiciously soupy, and by the next morning it had deflated completely. When I poured it out onto the parchment paper it acted more like goop than dough. It valiantly managed to produce some bubbles on the second rise, which seemed to disappear as soon as I lifted the dough into the preheated pan. Once baked, it was even flatter than the last loaf. Discouraged by the results with the first batch, I decided to leave the second half of the dough in the refrigerator for 48 hours instead of 72, since I was getting tired of flat loaves. I took it out of the fridge the night before I baked it so that it could come to room temperature, and it baked up just fine. 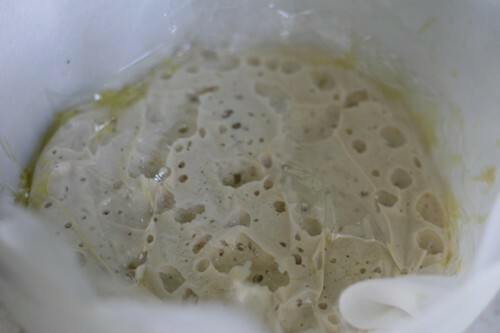 This is what healthy bread dough looks like after it's risen—lots of big bubbles. Now I had three loaves to taste side by side (I'd kept the leftovers of the first flattened loaf in the freezer). The dough that had risen at 75 degrees (in the oven with the light on) had a very cheesy, concentrated, developed flavor. I could swear I was eating Parmesan bread. There was a distinct sourness at the end, like the fallen batch that had spent 48 hours at room temperature—not quite like sourdough, but a little funky. The bread that had spent 48 hours in the refrigerator tasted distinctly sour up front, but less cheesy, with a complex, almost nutty flavor to it. Overall, the breads actually tasted quite similar to each other—though I could detect subtle differences in them, they were all good. Which means that I've come almost full circle back to the original recipe, with a few modifications (I use less salt, more water, and less time for the first rise). It's definitely not sourdough, but making no-knead bread with miso isn't much harder than making it without, and I've become a big fan of the cheesy, umami quality it adds to the bread. Combine the flour, salt, and yeast in a large bowl. Measure out 1.5 cups of water in a large measuring cup, add the miso paste, and mix with a fork until the miso is dissolved. Pour into the dry ingredients and mix well, then add more water a tablespoon at a time until the dough is sticky and shaggy (I usually use more than two tablespoons). 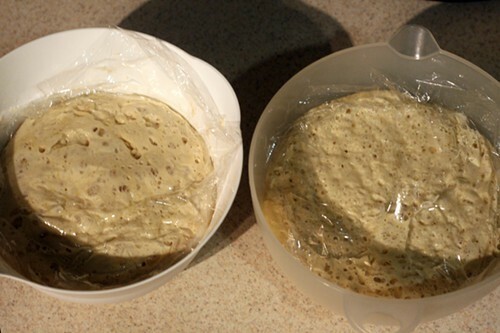 Cover the bowl with plastic wrap and allow the dough to rise at room temperature for 12 to 18 hours. Put a piece of parchment paper on the counter and coat it with olive oil. Scrape the dough from the bowl onto the parchment (I use my fingers for this, dipping them in the oil first to make sure the dough doesn't stick to them), spread it into a roughly even shape, and pull each of the four corners into the middle, forming a ball. Flip it over so the folds are on the bottom, use the parchment paper to transfer it back into the bowl, cover with plastic wrap, and let it rise for about two hours. Halfway through the rise time, put a large, heavy pot with a lid in the oven and preheat it to 450 degrees. When the dough is ready, remove the pot from the oven and use the parchment paper as a sling to transport the dough into the pot. Cover, bake for 25 minutes, then remove the lid and bake for another 20 to 30 minutes or until the bread is well browned. Remove from parchment paper and place on a cooling rack. The experts will tell you to cool the bread completely before cutting into it, but I usually can't wait more than an hour. Besides, if you let it cool completely you can't eat a slice of warm, fresh bread with melted butter, which for me is half the point of making bread at all.